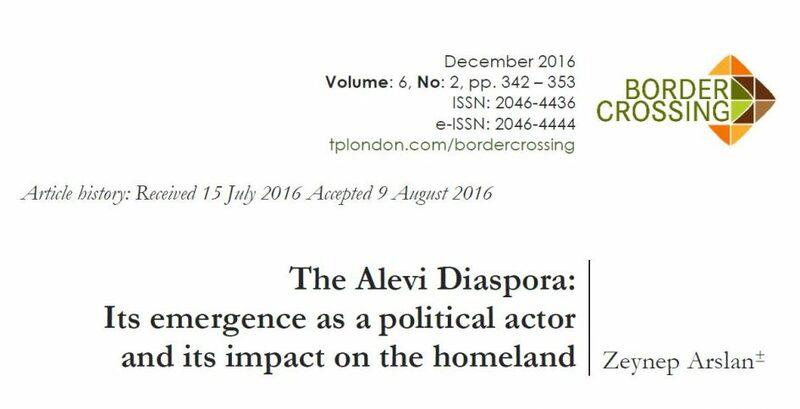 Through comparative literature research and qualitative analysis, this article considers the development of Alevi identity and political agency among the diaspora living in a European democratic context. This affects the Alevi emergence as political actors in Turkey, where they have no official recognition as a distinct religious identity. New questions regarding their identity and their aspiration to be seen as a political actor confront this ethnic group defined by common historical trauma, displacement, massacre, and finally emigration. It also raises important questions of what makes the Alevis a diaspora community and what are the chances and possibilities to influence the homeland. Furthermore, how does the self-identification process influence their awareness about the challenges resulting from their diaspora existence? Identifying the Alevis, also involves defining an ethno-religious group. The British historian Eric J. Hobsbawm (1992: 63) writes “‘Kinship’ und ‘blood’ have obvious advantages in bonding together members of a group and excluding outsiders, and are therefore central to ethnic nationalism. […] Yet the genetic approach to ethnicity is plainly irrelevant, since the crucial basis of an ethnic group as a form of social organisation is cultural rather than biological”. Regarding the definition of “ethnicity”, the German Sociologist Max Weber (1922) used the term “Kulturgemeinschaft” as a constructed imagined feeling based on feudal boundaries of togetherness. Political scientist Benedict Anderson (2006: 6) works with the terminology of “imagined communities” and says “In fact, all communities larger than primordial villages of face-to-face contact (and perhaps even these) are imagined. Communities are to be distinguished, not by their falsity/genuineness, but by the style in which they are imagined”. In this sense, the Alevis could be seen as an ethnic community due to their collective consciousness of togetherness beyond “blood” and “kinship”. While Karl Michael Reiser (1997) introduces the Alevi associations in Austria as “ethnic associations” and “political pressure group” in his diploma thesis Susanne Puchberger (2004) refers to Max Weber’s activity oriented, situational and instrumental theoretical approaches and points to the fact of boundaries and togetherness of groups depending on situational, strategic and rational purposes (p. 42). The Armenian scholar Victoria Arakelova (2010) defines the Alevis as a “religious ideology spread among various ethnic groups” (p. 14). She does not assert that there is a “unifying vector”, but she simply identifies “the belonging (sometimes formal) of self-awareness”. Another very important point in Arakelova’s research is “endogamy” within ethno-religious groups. The ethno-religiousness points to the connecting point and priority of religious items aside from the ethnic belongings. Arakelova writes, “The presence of such groups in different ethnoses indicates their sub-ethnic character, as well as the initially supra-ethnic character of the doctrine itself” (p. 6). Because Alevis do not proselytise, they have never felt the need to define a dogma explaining their beliefs to the outside world. Finally, in my research (Arslan, 2016) I wrote about Alevis, who are defined by their common political traumata and discrimination under central Sunni-orthodox and nationalist political discourses through history. After being pushed to the margins of the hegemonic society and always faced by “othering”, the Alevis reacted to Sunni-Islam by developing a common attitude opposing oppressive and discriminatory political actions. Many different groups are frequently counted among the „Alevis“ living in the Balkans, the Middle East and in different parts of Asia. However, they distinguish themselves from each other on a variety of points, such as their religious practices and views on Islam. For example, the Anatolian Alevis are different from the Nuṣayrī (also called the „Arab-Alevis“ or just Alawis; ‘Alawīyyah) and to the Ja’fari also called “Imami Shiites”). This article concentrates on the estimated twenty-five million Anatolian Alevis in Turkey and the estimated two million Alevis in the European diaspora. Also, the Anatolian Alevis contain different groups. Historian Hans Lukas Kieser (2001) notes a difference between the Western and Eastern Anatolian Alevis by also considering the particular condition of the Eastern Anatolian Alevis. For example, while the Western Anatolian Alevis mainly belong to the ethnicity of Turkmen, the Eastern Anatolian Alevis are mainly of Zaza or Kurmanc origin and therefore face multiple challenges resulting from the Turkish political paradigm of Turkish-Turk-Sunni-Islam. Above all, Alevi activists (Kaplan, 2009: 161) define the Sivas Massacre of 1993, in which Sunni extremists assassinated 33 Alevi artists and writers, as a catalyst for the stronger political organisation of the Alevi associations. The efforts for official recognition of Alevism as a legitimate religion became stronger in the 1990s. Because Alevism lacks a written text and therefore needs basic research on its origins and history, the Alevi adherents face the challenge of defining the particular Alevism and Alevi theology that should be recognised. The recognition processes were quite successful in European states, except Austria. The Islam Act of 1912 passed by the Austro-Hungarian Empire, originally regulated the rights of the Muslim minority from Bosnia-Herzegovina. After the end of the Austro-Hungarian Empire, the act was amended many times because other Muslim minorities migrated to the Austrian Republic. To recognise a particular situation for the Austrian-Anatolian Alevis, the act was again revised in 2015. The question of whether or not Alevis are Muslims and whether or not Alevism is a denomination within Islam has become a dividing issue within the Austrian Alevi associations. While the former president of the IGGiÖ, Anas Schakfeh (personal communication, 22 February, 2011) declared that Alevism remains diametrically opposed to Islam and Alevism is not accepted within Islam at all, this issue polarised the Alevis in their struggle to become institutionalised in Austria. This polarisation is no longer defined by ethnic differences, but by the Alevi position to Islam. The “Islam-Alevi Society in Austria” (German: Islamisch Alevitische Glaubensgemeinschaft in Österreich) has changed its name to Alevi Religious Community in Austria, ALEVI, (German: Alevitische Glaubensgemeinschaft in Österreich) and received official recognition on 22 May 2013. Since then, it has become accepted as the official representation for the Austrian Alevis (Official Gazette; 22.5.2013). However, in the meantime, another group of Alevis, who demand recognition of Alevism as a distinct religion without a subordination to the Islam Act of 2015, do not accept the exclusive power of ALEVI and continue their efforts for a separate recognition. This Alevi tendency recently defines itself as “non-Muslims”, while simultaneously using Islamic definitions and content to explain Alevism. While initially the discussion had been focussed on the definition of Alevism, the Austrian Department for Religious Affairs (German: Kultusamt) finally broke the political power of the Islamic Religious Community in Austria IGGiÖ (German: Islamische Glaubensgemeinschaft in Österreich), which officially represented all Muslims in Austria. The Austrian government recognised one tendency of the Alevi adherents, who sought recognition of Alevism within the Islam Act of 2015 (Arslan, 2016: 206f). Those Alevis criticised the Islam Act of 1912 for not covering all Islamic tendencies and therefore thought it was discriminatory. To be clear, the revision of the Islam Act of 1912 attempted to break the hegemonic power of the IGGiÖ. Therefore, the Shiites are also officially registered as a “registered religious community” as the Islamic Shiite Religious Community in Austria (Shia) since 1 March 2013 (Austrian Department for Religious Affairs; Kultusamt Österreich). This happened in the shadow of the Austrian government’s policy that Islamic religious teachers will no longer be accepted as diplomatic envoys from Turkey to teach Muslim children at Austrian schools. This had created many scandals due to extremist Islam propaganda through teachers primarily sent from Turkey. According to the Islam Act of 2015, the Austrian education system will begin in 2017 to train Islam teachers. Moreover, the new Islam Act of 2015 sought to stop the financial and political influence of Turkey within the IGGiÖ. Currently, the Anatolian Alevis, both in Turkey and in the diaspora, are divided into two main groups. One group does not question the Alevi subordination to Islam; its critics mostly define this group’s adherents as “the Alevis of the government” (Turkish: Devletçi Aleviler). This group is more or less institutionalised by the Cem Foundation in Turkey and could be defined as Anatolian Shiites. Its followers question the hegemonial position of the Turkish Presidential Department for Religious Affairs (Turkish: Diyanet İşleri Başkanlığı; Diyanet) for its exclusive representation of Sunni Islam. The other group is represented by Alevi adherents who partly question their relationship to Islam and refuse the existence of the Diyanet and resist any government intervention on religious issues. This group associates with the Confederation of the Alevi Associations in Europe and with its counterparts in Turkey, the Alevi Bektaşi Federation and the Pir Sultan Abdal Culture Associations (Turkish: Pir Sultan Abdal Kültür Dernekleri). It opposes the Turkish government ruled by Recep Tayyip Erdoğan (Alevi Bektaşi Federasyon’u). However, the average member does not have a clear position towards Islam. It does not seem possible yet to have an alternative explanation for Alevism as beyond Islam or at least without using Islamic items. Therefore, the new position of Austrian Alevis due to the particular situation explained below, such as “non-Muslims” seem to enable new discussions within the community both in Turkey and in the Diaspora. The processes of legally registering Alevism has succeeded in the European diaspora, except for the particular situation in Austria. However, Alevism is not formally recognised in its homeland, Turkey. Alevis still fear assimilation and persecution. The Turkish government ignores rulings of the European Court for Human Rights, such as the case brought by Hasan Zengin concerning compulsory Islam instruction at school in 2001 (EGMR: Hasan und Eylem Zengin gg. Türkei. Ruling of 9.10.2007). The first years of the Justice and Development Party (AKP) raised hopes for many people in Turkey. However, the first democratisation initiatives (Turkish: Demokratik Açılım Paketleri), did not fulfil their promises. In 2012, when Recep Tayyip Erdoğan became prime minister for the second time, he declared his project to create a “Religious Generation” (Turkish: Dindar Nesil) (Daily Newspaper Hürriyet; 2.2.2012: “Dindar gençlik yetiştireceğiz”). The AKP aims to continue this vision. In November 2015, the AKP again started to analyse the first reports about the democratisation openings, which originally started in 2009 (Daily Newspaper Milliyet; 15.11.2015: “Yol haritasının beş önceliği”). The government plans to introduce a bill establishing a foundation to represent the Alevis; to start a university related to Alevism; to officially recognise the Cem-Evleri as the buildings for the religious rituals of the Alevis; to cover the administrative and actual expenses within the Cem-Evleri; and to pay the religious officiants of the Alevis, called Dede or Pir (Online Newsportal Radikal; 18.1.2016: “Hükümetin yeni ‚Alevi paketi’nde neler var?”). Currently, newspapers in Turkey debate whether each elementary school pupil should be forced to visit the mosque at least once a week. In 2015 and the first half of 2016, during discussions about constitutional changes (Turkish: Anayasa Reform’u), most Alevis in Turkey demanded the suspension of compulsory religious instruction; the suspension of the Diyanet; the official recognition of the Cem-Evleri; the reimbursement of costs for the Alevi pilgrimage Hace Bektaş Veli dermal; the end to the establishment of mosques in Alevi villages; the renovation into a museum of the Sivas Madımak Hotel, the site of the massacre of 1993; and the official recognition and apology for the Alevi massacres. The opposition Alevis, who do not conform with government policies and who do not accept subordination within Islam, complain primarily about the lack of direct government dialogue with all the Alevi tendencies in Turkey; they see the government as only representing a Sunni hegemony. The former Prime Minister, Ahmet Davutoğlu, met with some deputies of the Alevi Initiative in March 2016. The daily newspaper Milliyet (2016) reported that the deputies complained about European governments cooperating with Alevi associations in the European diaspora, above all in Germany, to declare Alevism as a religion apart from Islam. Milliyet reported that Davutoğlu should have said that the relationships to the Alevi communities that are closer to the Islamic culture must be maintained with scrupulous care. The absence of an Islamic hegemony in Europe enables the Alevis to think about an Alevism independent of Islam. In this process, political and juridical issues seem to dominate over the religious contents of Alevism, both in Turkey and in the European diaspora. The Alevi communities regularly organise commemoration of the historical massacres. They also act in solidarity with oppressed groups, such as the Kurds and recently the Gezi protesters in Istanbul. Both their common historical traumata and their political attitude inspire solidarity. Worship of the Twelve Imams, adoration of the patron saint Hızır or Xızır, the Qur’an and the Cem-Evleri seem to fulfil a more symbolic function that helps protect against Sunni-dominated government and the changed spatio-temporal circumstances in the diaspora (Arslan, 2016: 71fff and 158fff). Above all, the common historical trauma and therefore the demands for democratic rights, participation, and equality seem to define the togetherness of this population that is known for its oppositional character, but even more for its historical survival and methods for self-protection within centrally ruled Systems. The achievements of the Alevi diaspora in Western Europe inspire the Alevi adherents in Turkey to demand their democratic rights. At the same time, the Alevis in Turkey are alarmed by the Anatolian Alevis in the European diaspora openly debating whether Alevism belongs to Islam. Historically, the Anatolian Alevis placed a high priority on concealing their religious practices (Turkish: Takkiye) from a threatening regime, this led to a life in territorial and social isolation. The Anatolian Alevis had a somewhat critical position to the orthodox Islam of the Ottoman Empire, but they did not really question or reject their relationship to Islam. To the contrary, the more they were harassed as unbelievers within a Sunni Islam dominated empire, they searched for protection in an Islam offered by the Persian Empire. Additionally, the so-called Kurdish Alevis, registered as a religious community in Austria, define Alevism as a pre-Islamic pagan and pantheist belief system (Ancient Alevi Religion Community in Austria (German: Alt-Alevitische Glaubensgemeinschaft in Österreich, AAGÖ). In: Homepage of the Austrian Department for Religious Affairs (German: Kultusamt). Furthermore, they understand it as a religion fully separated from Islam, even tracing the origins of Alevism back to Zoroastrianism. However, Islamic references are used symbolically. An important development shaping the positions of the Anatolian Alevis in Europe with regard to the Anatolian Alevis in Turkey happened when the president of the Confederation of the Alevi Associations in Europe, Turgut Öker, declared his candidacy for independent deputy in the 2011 parliamentary elections in Turkey (Arslan, 2016: 127f). The Alevis in Turkey did not welcome this action. Due to their own socio-political circumstances, they once again supported the Republican People’s Party (CHP) as a balance against the AKP. Since the increasing power of the AKP hinders a clear democratisation process in Turkey, the Anatolian Alevis in Europe can be seen as more clearly supporting Kurdish issues and the pro-Kurdish Democratic People’s Party (HDP). Due to their economically poor position and their non-Turkish ethnic background, the Eastern Anatolian Alevis belong to among the largest groups of migrants to the Turkish metropoles and the European diaspora since the beginning of the 1960s (Arslan, 2016: 85ff). The growing anti-democratic pressure of President Recep Tayyip Erdoğan has caused all the democratic fractions of the Alevis, especially the Confederation of the Alevi Associations in Europe, to support and join in solidarity with some left-wing migrant organisations from Turkey and Kurdish associations (Pro-Kurdish Newspaper Yeni Özgür Politika (9.4.2015): “HDP ile ‘yolumuz’ bir”). In the Turkish parliamentary elections on 1 November 2015, votes from the Anatolian Alevi in Europe enabled the HDP to reach the 10 percent threshold necessary for representation in parliament (Online Portal Internet Haber, 2.21.2015): “Oradan gelen oylar HDP’ye barajı geçirtti”). All attempts to define Alevism have related it to Sunni Islam. During the recognition processes of Alevism in Europe, both Alevis and European institutions related it to Sunni Islam. Defining and considering the content of Alevism without using the principles of Islam does not seem possible yet. In the particular situation of Austria, the Federation of Alevi Associations in Austria made a new manoeuvre and declared, “We are not Muslims.” However, in the context of the declaration, “We are not Muslims.”, this raises the question of where to put the first Imam and the fourth Caliph Ali (Alī ibn Abī Ṭālib), the adoration of the Twelve Imams, and the Qur’an. The Alevi Islam supporters claim that Alevism is the beginning point, the source of the Islam; however, this also might appear quite strange to around two billion Muslims of the world. At the same time, a part of the Kurmanci- and Zazaki-speaking Alevis, the Eastern Anatolian Alevis, try to point to their non-Turkish ethnicity, and therefore at the multiple discriminations they suffer within the Turkish Republic. Because the issue about the relationship between Alevism and Islam is still not resolved, this polemic will be continued. Until now, the Alevis seem to have little interest in concentrating on that issue at an academic level. As long as scholars cannot define Alevism as a belief system independent from Islam, a long-term subordination and assimilation to Islam seems inevitable. No Alevi can clearly answer the question “Who is an Alevi and what is Alevism?” without referring to the massacre and harassment of Alevis and Alevism in Turkey. This is supplemented by their common traumatic memory, their unequal and disadvantaged position under the Sunni Islam members within the Turkish Republic, etc. These are mainly political issues, which are underlined with fear and worry about future massacres and assimilation. The solidarity with the Kurds in Turkey and in Europe through the Alevi associations focuses on a democratisation process in Turkey and equality for everyone. Nevertheless, an important part of the Alevis also fear oppression and massacre through the Schāfi-i Muslim Kurds in a possible Kurdish territory in the future (Erman and Göker 2000: 100). The situation of the Alevis and the Alevism cannot be understood without analysing their attitudes and survival strategies, which are sometimes seen as opportunistic (Arslan, 2016: 73ff. and Massicard, Elise, 2012). The Alevis take particular positions, according to the political circumstances. The CHP always seems as a protector from the takeover of Islamic power in Turkey. Currently, the HDP seems to promise democracy, diversity, equality, and equity in Turkey. More than before, it seems important that democratic Alevi stakeholders manage to define a common denominator consisting of the commonly accepted humanist and key values of Alevism, namely personal pacifism, social peace, and universal human rights. Along with the regularly performed commemoration rituals of the Alevi Associations, on the one side, and their solidarity actions with the oppressed groups in Turkey, on the other side, they now need to establish a clear vision and perspective on Alevi theology and Alevi political values, clearly defined without external ascriptions, with clear purposes, and without worry about new massacres and assimilation. An Alevi position that simply seeks protection by supporting parties, like the HDP, that support universal democratic norms, strongly differs from an Alevi position of developing an identity as a confident political actor, organised with strong demands and with a consciousness and awareness about the political context, that co-operates on an equal level with other political actors struggling for democracy. Furthermore, this standpoint as an openly political organisation could increase the confidence of all sides. There are two reasons why Alevism cannot be defined without the historical, social, economic and political dimension and the theological dimension. Firstly, the Alevi history is a history of massacre, oppression, and harassment and therefore it is not possible to define Alevism beyond these subjects. Secondly, to keep alive Alevism within the new socio-political circumstances, Alevi adherents must establish a clearly defined Alevi religion. These points can be reached after establishing a self-confident belief in Alevism’s own visions and aims. Finally, evidence for the need to develop clear, self-confident, self-organised Alevi membership, can be seen, during the first 13 years of AKP rule in Turkey, in the government’s attempt to methodically identify Alevi houses and places of religious ceremonies. Furthermore, since spring 2016 the AKP government will establish a camp for 27,000 Syrian Sunni refugees in the middle of Terolar a location very far from the Syrian border with around 9,000 Kurdish-Alevi inhabitants, who have faced multiple discrimination because of both their Alevi and Kurdish identity throughout Sunni-Turkish rule during the Ottoman Empire and the Turkish Republic. The Alevis understand this development as a typical Turkish-Sunni effort to force assimilation. Considering the danger and worry about new massacres, continuing discrimination, and oppression, the Alevis generally failed to establish a united strong political approach and organised Alevi identity. Because former activists of the Turkish Socialist movement of the 1970s monopolise key positions within the Alevi associations, the Alevi movement is not able to develop new visions for the future and still keeps looking to the past when deciding on their political practices. The main value in the Alevi faith is pacifism; therefore, an estimated 25 million Alevis living in Turkey must be able to clearly and effectively define a political programme to encourage peace and democracy. All the political parties in the Turkish Republic have been aware of the big potential of the Alevi population in Turkey. The Alevis must start to realise their important role as a political actor both in Turkey and in the diaspora. Independent of whether Alevism is officially accepted or not, the more stable that democracy becomes in Turkey, the more chances Alevis could have to survive and live without fear and discrimination. Puchberger, Susanne (2004): Transnationale Aspekte im Alevismus : sozial-anthropologische Analysen zu Geschlechterrollen in sozio-religiösen Transformationsprozessen. (Unpublished Diploma Thesis). Social anthropology. University of Vienna. Reiser, Karl Michael (1997): Das sozio-politische Netzwerk türkisch-alevitischer Einwanderer und seine Auswirkungen auf die Identitätsentwicklung der „Zweiten Generation“. (Unpublished Diploma Thesis). Social anthropology. University of Vienna. Ja’fari is the third tendency, beside the Ismailis and the Zeydis, in the Shīʿah rite of Islam. The Jaferi are not generally recognised by the Sunni-dominated Islam world, because of their strict position against the second and the third Caliphs in Islam, who did not support Imam Ali to serve as the fourth Caliph succeeding the Prophet Mohammed. Today this tendency of the Shīʿah rite of Islam is supported by the Iranian state. In Turkey, the most popular leader of the Cafer-i school is Selahattin Özgündüz, who very much favours the Iranian regime. Many political activists within the Alevi associations and the Kurdish movement argue that the Sivas Massacre was a part the so-called deep state’s plan to interrupt the Alevi support for the Kurdish movement. Democratisation initiatives for the Romas, the Kurds, and the Alevis. The meeting places of the Alevis to practice religious rituals. Before the 1960s, the Alevis conducted their religious ceremonies in any place. The establishment of Cem Evler’i is a modern development due to the institutionalisation demands of the Alevis for the last 20 years. The religious instruction in Turkey focusses on transmitting the Sunni version of Islam. In regards to steps to safeguard their religious beliefs under the new circumstances within the new homelands in the diaspora, see: Arslan 2016:158. The battle of Chaldiran (Province in North-West Iran) on 23 August 1514 between the Ottoman and the Persian Empires, which ended with the victory of the Sunni-ruled Ottoman Empire, was the historic breaking point for the Anatolian Alevis, determining that they would become Shiite. Shah Ismail, the emperor of Persia and the leader of the Safawi Dynasty, had an intensive relationship with the – above all, the Eastern – Anatolian Alevis. He and his father and grandfather shared the goal of annexing Anatolia to the Persian empire. Attempting to balance, or moreover, seek a clear demarcation with the increasingly Sunni-ruled Ottoman Empire, Shah Ismail established the other orthodox movement in Islam, the Shii’tism as the state religion in Persia. That is also an important reason for the bigger influence of Shii’tism within the Eastern Anatolian Alevis. Although Shah Ismail grew up and socialised with the Alevi-Kizilbas rite, due to its non-hierarchical, un-institutionalised and non-orthodox character, it did not seem appropriate for ruling a large empire. (Arslan 2016: 85fff). Zoroastrianism, also known as Mazdeism, is the oldest known philosophy and world religion based on the teachings of Zarathustra, who is believed to have lived in the 6th century BC in what is now Iran. The teachings of Zarathustra are recorded in the book of Avesta. Some Kurdish nationalists believe Zoroastrianism to be their original religion and that they were forcibly converted to Islam between the 7th and 9th centuries. District in Maraş, a province in eastern Anatolia.